Chopping all of the apron mortises this week gave me plenty of time to contemplate, the heat wave that has been stable over the U.S. There were several blogs that showed fellow woodworkers installing air conditioning. After last Wednesday night it certainly sounded like a great idea, but I waited for the weekend and the temperature has declined. 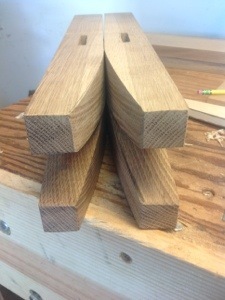 After completing all of the mortises for the aprons, the through mortises remained. I laid them out on each edge careful to align and mark each side. 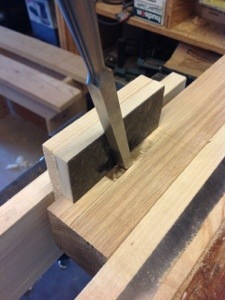 cutting three of the mortises I realized that I marked them all 1/2″ wider than I intended. Fortunately I have not cut the lumber for the pieces yet and will have to adjust. Hopefully that’s the one mistake for this project. 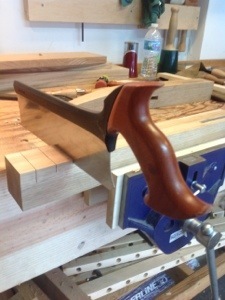 The final mortise completed I again turned to shaping the legs. Placing them on top of my bench it became clear that shaping the legs would lighten the look of the table so I proceeded as planned. 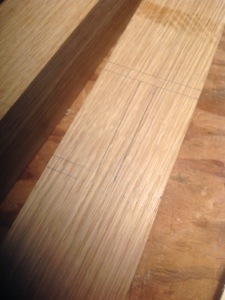 I made a template from some 1/2″ pine and used it to lay out all of the cuts. Making saw cuts to help ease out the pieces I chopped the waste wood away from the lines. Quickly planing the first leg I held It up and studied the slight change in color where I cut across the lamination. It looks OK. I will always know that the joint is there but it is not noticeable to the casual person. 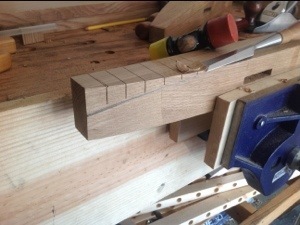 With the temperature lower I hope to push ahead with fitting the tenons and shaping the aprons.